Jack Britten has depicted his traditional homelands country- Purnululu. Purnululu (Bungle Bungles Ranges) is a World Heritage Listed area in the Kimberley region of Western Australia. The ranges are spectacular geological landmarks which appear as orange and black striped sandstone domes. Stories Country around Turkey Creek, Ord River, Bedford Downs, Flying Fox, Limestone Country east of Kimberley, Centipede, Bull Creek Country, Purnululu (Bungle Bungle Range), Hermit, Barramundi, Initiation, Night Corroboree, Female Spirit. Jack Britten was born at Tickelara in the East Kimberley region of Western Australia. As a boy he was taken to work as a stockman and later as a road worker. In 1982 Jack moved back permanently to Frog Hollow (Woorranginy), in the East Kimberley where he worked to establish the Worranginy Outstation. Jack Britten began ochre painting early in life. His grandparents taught him to paint using traditional materials, methods and themes. Distinctive features of his painting are the use of bush-gum or sap from trees as the binder for ochre (natural earth pigment) and the use of saw-toothed incising. Jack Britten, a senior Gija (Gidja) lawman, focused his paintings and screenprints on his country in the East Kimberley, its origins, ceremonies and ancestral figures, merging into its spiritual and physical landscape. His Dreamings depict a lateral landscape perspective and gentle clusters of dome shaped ranges representing Purnululu (World Heritage listed Bungle Bungle Range). He is known for his exploration of the landscape using rough textures and bold designs, with distinctive dotting to outline the landscape forms, and to describe the country with its underlying presence of ancestors and ceremonies. Jack often incorporated body markings into his work to emphasise his ritual seniority. 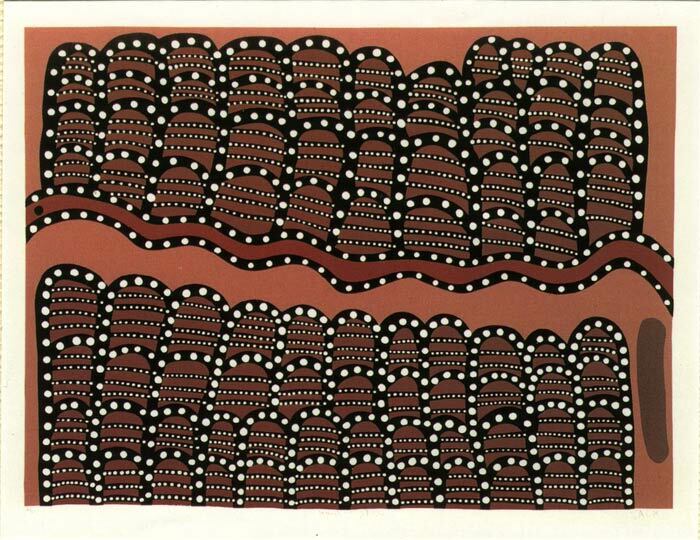 Aboriginal Artists of Western Australia, Aboriginal Education Resources Unit, W. Australia. Australian Art Collector, issue 7 1999 Caruana, W., 1993, Aboriginal Art, Thames and Hudson, London. Dixon, R.A., & Dillon, M.C., 1990, Aborigines and Diamond Mining: The Politics of Resource Development in the East Kimberley Western Australia, University of Western Australia Press, Nedlands, Western Australia. 1988, ANCAAA and Boomalli, Boomalli Aboriginal Artists Ko-operative, Sydney. McCulloch, A.,and McCulloch, S., 1994, The Encyclopaedia of Australian Art, Allen and Unwin Pty Ltd, St Leonards, New South Wales. Ryan, J., 1993, Images of Power, Aboriginal Art of the Kimberley, National Gallery of Victoria, Melbourne. Smoker, J., 1989, Turkey Creek Recent Work, Deutscher Gertrude Street, Melbourne.